The Properties dialog box allows you to change various properties of a Sketchpad object. •Select an object and choose Edit | Properties. The keyboard shortcut for Properties is Alt+? (Windows) or ? (Mac). •Select an object and choose Properties from the Context menu. 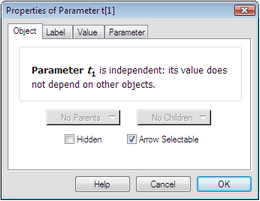 •Show the object's information balloon and click the object's name in the balloon. The Properties dialog box is arranged into separate panels of related properties. Switch from panel to panel by clicking on the tabs near the top of the dialog box. Which panels are available depends on the type of object selected. When you finish modifying an object’s properties, click OK to make the changes permanent or click Cancel to leave the object with its original properties. When you click in the sketch to switch to a different object, your changes for the original object are made permanent before Sketchpad switches to the new object, just as if you’d clicked OK for that original object. Keep in mind that for any specific object, only a few panels appear — not all of them! Here are the possible Properties panels and the types of object for which each panel appears.